As the moldmaking industry grew more competitive, Build-A-Mold (BAM) wanted to apply a production mentality to its custom mold making in order to open up capacity. 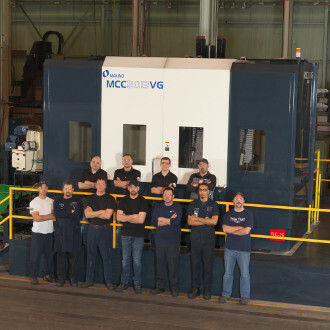 To accomplish this goal, the Windsor, Ontario, Canada, company knew that it could no longer operate effectively with its commodity vertical machining centers, which often needed adjustments. If it were to continue to serve as a “one-stop shop” to automotive OEMs and maintain its reputation for providing quality steel cores, cavities and small parts, BAM would need new technology to improve its steel milling capabilities and EDM workflow. A FCS clamping system was added to both the a61nx cell and the MCC2013-VG. Operators also attended training at Makino’s facility in Mason, Ohio, in preparation to make the most out of their new equipment. In less than a year, the company transformed dynamically, from the way it orders materials to how it processes work and manages on-hand inventory. With its robotically automated F-Series cell, BAM no longer needs to outsource its electrode production, which has resulted in an annual saving of $150,000. Now BAM can perform all of this work in the cell with fewer machines, and operators can be redeployed into more value-added roles around the shop. This has led to dynamic cost reductions with less capital, more floor space, fewer labor hours, lower maintenance, less energy consumption, and fewer fixtures and tooling. BAM has eliminated multiple operations and removes more material on its large molds with its MCC2013-VG. Quality of parts has been improved, and finishing operations have been brought back in-house. The company is achieving tool blends of 0.0005 inch and parting lines of 0.001 inch, leading to secondary grinding operations, and cutting time from fitting and spotting being reduced by 70 percent. The machine has replaced seven commodity VMCs, helping BAM become more competitive. Secondary operations have been reduced and tooling expenses have been decreased by 40 percent. This machine runs unattended. The a61nx cell has slashed lead-times of its small mold components in half. The company can now mill rib features that would have previously required EDMing. As it meets shorter lead-times, BAM has benefited from repeat jobs. The FCS clamping system has cut setup times in half by eliminating the manual indicating of fixtures and components and helping BAM become more flexible when it comes to engineering changes. This system has helped the company evolve into more of a production operation. By creating greater efficiencies and cash flow throughout other segments of the business, BAM has become a more highly valued asset within its parent company, A.P. Plasman.